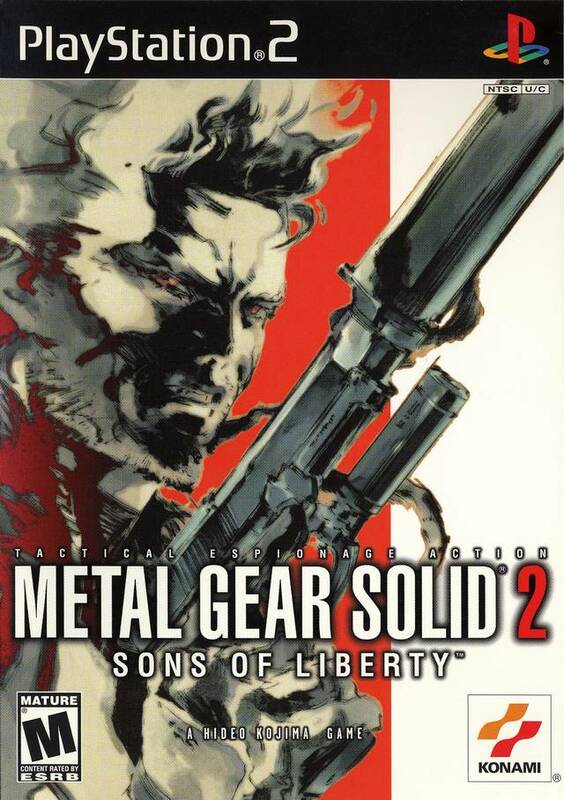 Snake returns in the stealthy action title, Metal Gear Solid 2: Sons of Liberty. 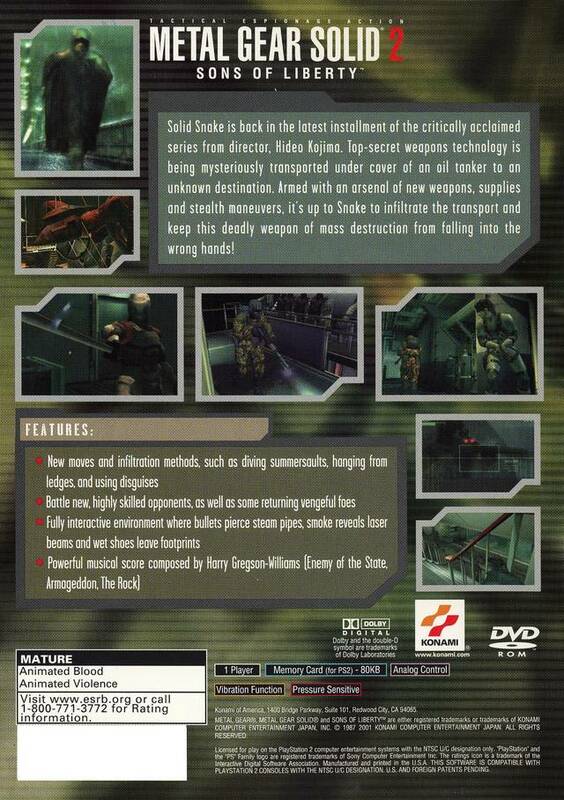 Solid Snake is a one-man army determined to stop a deadly high-tech weapon from falling into the wrong hands. Encounter familiar faces including Revolver Ocelot and battle the new war machine, Metal Gear Ray. This time around, enemies are more aware and agile, so you must use your skills in stealth, weaponry, and counter-terrorism to fight off the competing powers. I found one of my favorite games of my childhood in very good condition, so thank you guys, i experienced a very good shopping at lukiegames ! Excelente juego de PS2. La opción de compra "completa" es excelente, y en muy buen estado de conservación la caja y manual. Amazing game, came on time no flaws. You do not do much playing of this gem, the cutscenes are numerous and quite dragged on. But for those who remember seeing these CGI cinematics when this puppy was fresh, it's all good. Graphically dated, as is expected, but never a hard choice, for a 5 buck pricetag, a must have. This game is awesome. It has great gameplay, story and graphics. I didn't like that there is another protagonist to replace Solid Snake. Overall, it is an awesome game to play on the PS2. Yet another game I've purchased from Lukie Games That came practically brand new. It's not only hard to find these games in at least working condition but also to get them complete with the case and booklet as well? Everything came in pristine condition!!! This is a cool stealth / action game. the gadgets you get like proximity sensor that makes your controller vibrate when someone is close. To the weapons and special moves to the wicked storyline that will leave you wondering if all of it is real or a game for your character.i liked this game and it was in brand new condition. And it was cool Lukie Games had it. Thanks again Lukie Games For another Great game. Solid Follow-Up On Metal Gear Solid for PS1. 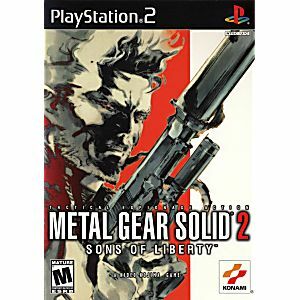 This game is the First MGS Game to Be Released on the Playstation 2 System, and it is a Great follow up to MGS1 for Playstation 1. You are a Covert Agent that Goes in a Terrorist Over-run Top Secret Operation on a Oil Platform out in the Pacific called the Big Shell. Solid Snake Supposably Died in a Oil Tanker Explosion 3 Years Earlier (Yes you Play that Mission as Well, as the Prelouge) You Ultimately Find out Solid Snake, Iriqoius Pliskin Never Died, and he In fact is your Covert Partner on the Big Shell. The Games Dialogue and Story is Very Tactical Espionage Superb, and Develops a DEEP Moving Story, That You Personally Experience when Moving Along Deeper into the Game. Im giving this a Solid 5 Stars, for Being a Great Fulfilled Metal Gear Solid Title, A Must to add to your MGS Collection.